Can you read this Bible verse? If you figured it out, how long did it take you? Look at the end of this blog to see what verse it is, then go back and read it again, and it makes a lot more sense. Like most of you, I grew up speaking the same language at home that saw used at school and at church. It was in that language that my parents and others taught me from the Bible. For those of us in that situation, it is difficult to imagine what it is like to have to go to school and learn about God in another language. But we can get a taste of that. Just imagine that you had to go to school in Sea Island Creole, that church was in that language and that was the only Bible you had. Over 300 million people in the world speaking more than 2,000 languages have to do all their learning and Bible reading in another language. Sea Island Creole and English are very closely related. In fact, Sea Isla nd Creole came from English. But what would it be like if the language in which you had the Bible was not closely related to the one you spoke? That is the situation for many people in Africa and around the world. Just look at this page from the Gospel of Luke. English is a strange to those who speak this language as this page is to you. So, when people in Africa get the Bible in their own language we get all sorts of comments. At one showing of the Jesus film in their language the Christians present were exclaiming “We can understand everything!” That is good, but is also is bad. Good because they are understanding. Bad because it means that they are not used to understanding when they are in church or when the Bible is read, so it is a big surprise to them when they do understand. Can you imagine it being an unusual thing that you understand what is said or read in Church? So, let me know what you think. How hard was it for you to decipher the verse? Sea Island Creole is spoken mostly in the United States. 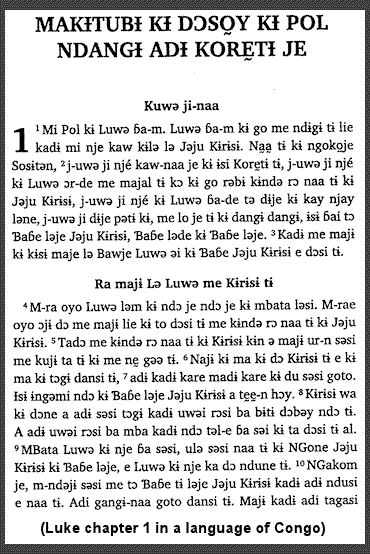 If you want, you can look through the Sea Island Creole translation on line at http://www.gullahbible.com/. This entry was posted in Bible impact, Bible translation, Christianity, Faith now, Heart language, Language and tagged Gullah, Sea Island Creole. Bookmark the permalink.